You can check out the first part of this series from Danikov here. Valkyrie activity is steadily growing as Oculus Rift deliveries continue to arrive around the globe. We recently saw some exciting news with Valkyrie being confirmed as coming to the Vive this year, so for those who opted for the HTC hardware, also in initial shipping, hopefully you won’t have to wait long to get in the game. As with last week, we’re looking at streamers and video producers already generating Valkyrie content. Whether you want to improve your flight skills or just get a taste of the game, these are the ones you want to follow. What attracted you to EVE: Valkyrie? I was a fan of EVE: Valkyrie before it was “EVE: Valkyrie”. I was at EVE FanFest 2013 in Iceland when they announced EVE:VR to the world, and was almost the only guy in the room who was all “Woo!” and clapping when it came up lol. Apparently VR was still a shocking/unknown to most people around the time. I got to try it there and talk with most of the devs then who were the ones to create the initial prototype in I believe it was 7 devs in 4 or 5 weeks? I could be wrong, but it was a short timeline and a handful of devs doing it all on their own time. The game itself looked and felt the same then as it does now though so it is cool to see the original design make it from concept to reality. Do you play EVE? I play EVE currently in the way of keeping a live account going to train skills. I have been meaning to make it back in and actually find an active corp to actually do some stuff in EVE, but finding the time for it just has not been easy, and I have a dumb emotional attachment to my current corp that I have been with since ‘06 but unfortunately as most of them are all Euro time, I rarely see outside of the weekends. One of these days…. Have you produced content for other games? I am not a dev by any means so unfortunately I only can produce videos for say Twitch/YouTube or from the real world doing my side drone videography business. I’ve dabbled in the modding scene in the early 2000’s but until I can shove a coding language into my brain, I am more of the light tinkerer than anything, though I am fantastic at Q&A and finding workarounds for issues. Required skill for the early days of VR. What is unique about your stream? My streams are so far 90% VR so if you want to see the latest and greatest VR tech and game/demo, I probably own it or can get it to be shown. I love answering tech questions related to VR or anything else that my viewers would like to know. With a broad extensive tech background as well as a lot of other life experiences, I love to share my passions with anyone who might be interested. What are you expecting from or hoping for with Valkyrie? 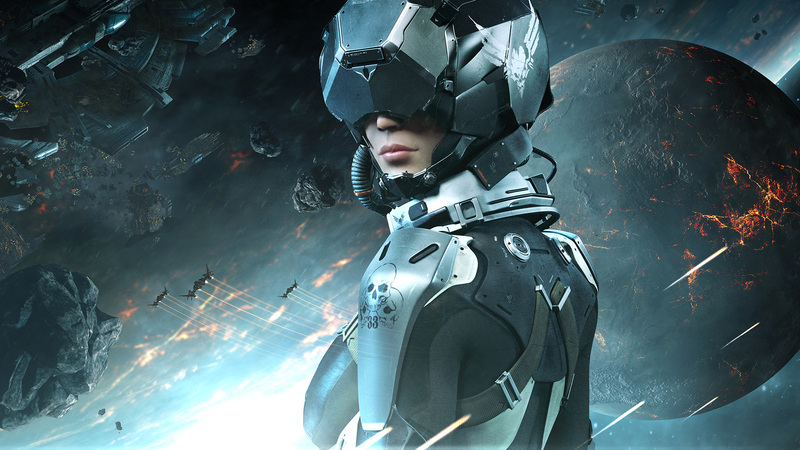 I would like EVE Valk to be a great go-to VR sim game for newcomers and veterans alike, not only that, but after experiencing what can be done from CCP with games like EVE and DUST 514 combined, EVE Valk hopefully can be connected to the core EVE universe in some way that what you do here, can have an effect on the greater EVE community. Heck, if we could get VR piloting inside EVE someday instead of it being internet spreadsheets forever, that would be mind blowing and possibly open EVE up to a whole new level of EVE newcomers. We will have to wait and see, but the potential is there. twitch.tv/bammhavoc / BAMMSTERS’s Flight School I’m a YouTuber, Gamer, welder and I fix friends’ cars. I live about 5 miles from CCP Newcastle and am very often chased away from there; apparently, CCP doesn’t approve of me licking their windows. Alternatively, I can be found in a pub enjoying the beer on offer. What attracted you to EVE: Valkyrie? G_Torq and BookerDaLooker pointed it out to me at FanFest and I was instantly hooked, so much so that we did a Eve Valkyrie Introduction video and a few KSP spoofs and started the Eve Valkyrie Flight School; more videos will be joining them soon. Finally, after 20 years, VR Tech has reached a point that it is viable and can be used to be fully engulfed in an immersive game. Eve Valkyrie is the perfect match of game and VR, so who wouldn’t want to play it? Do you play EVE? Yes, but I don’t want to go further than that… tend to keep my Eve shenanigans on the QT, but I will say that I have shot down Chribba Veldspar and, this one time in nullsec, I saw Scott Manley in local..
Have you produced content for other games? Yes, If a game or interests me enough I will make content for it. Battlefield 4, DUST514, ADIOS, The Division, Destiny, and the odd RL fixing cars videos. I run a weekly podcast along with some of my gaming buddies, that has both an RSS feed for those of you that prefer to DL it for your daily commute to work and a YouTube playlist for those that prefer YouTube. We have a small website that is currently going through a major rebuild so if you click the link be warned, wear a hard hat. Safety First. What is unique about your content? Not sure if it is unique, there are other content creators out there but as far as I am aware Bammsters is the only YouTube channel covering Eve Valkyrie, Don’t quote me on that though… I am probably wrong and I am too lazy to look. It’s also sort-of unique in its format with multiple distinct segments and an ensemble crew. What is your favourite ship? Currently my favorite ship is the Wraith, a very underrated little fighter that nobody takes a second look at and before you know it …..Bang! You are dead. What are you expecting from or hoping for with Valkyrie? Hmmm.. This is a tricky question Eve Valkyrie is a new IP, new IP’s are difficult and can make or break companies, I honestly hope Eve Valkyrie does well. I feel it hasn’t been given the props it deserves and is getting very little in the way of exposure… that is where I hope to come in and create the content and give Eve Valkyrie the exposure it deserves. I don’t know what to expect really, VR and Eve Valkyrie are new but I do know that CCP Newcastle has worked tirelessly on the game, we need to support it in anyway we can. 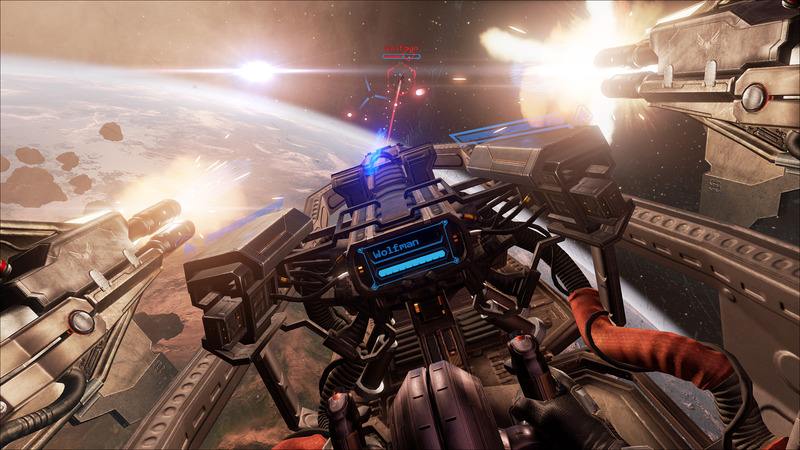 Eve Valkyrie Is the game for VR nothing else compares to it… in my mind. Do you play EVE? I’ve been messing around in New Eden since 2009 where I started as a lowly student in EVE University using a very basic laptop. Having some great and fun times in there with the other students I heard about CCP’s annual Fanfest in Reykjavik, which is somewhere I’d always wanted to go. Having got there and meeting these people that I’d only heard on Mumble in the flesh was a lot of fun and I fell for Iceland hard. It’s a great place where everyone is very relaxed and progressive while at the same time being a little bit crazy in a good way. I went the year that CCP were first showing off a playable version of Dust 514 on the PS3. It was very rough but I could see the potential. Getting into the beta for it I could see that there was a need for the DUST University much like in Eve. I was asked to run D-UNI and in doing so I got speaking to the Dev’s for the game both at Fanfest and online, providing feedback directly to them about what the game needed to work in the New Eden Universe. I’ve been elected now to both CPM1 and CPM2, Dust’s equivalent of EVE’s CSM working closely with the CCP Shanghai office both with Dust on the PS3 and with its new incarnation on PC using UE4, much like Valkyrie. Have you produced content for other games? I’ve done a little streaming of Dust on Twitch in the past but doing it on the last gen consoles is a bit more of a challenge than PC. I have produced a number of tutorial videos for Dust on my YouTube channel. I’ve had a lot of fun doing them and wish I could’ve done more but having a full time job there are only so many hours, as you can imagine. What is unique about your stream? I’m not trying to do anything unique or special with my Valkyrie stream, it’s just a guy having fun with this really cool game and the VR tech it uses. I’ve been a gamer for nearly 40 years, since the very early days and this is my third VR revolution, but this time the tech works and it does what we’ve always wanted for our games, which is near total immersion. What is your favourite ship? My favourite ship is always the next one I’m trying to unlock next. I’m not playing as much as I would like as I’m building up to this year’s Fanfest and working on additions to the Dust cosplay that I wear while there, so I’ll easy to spot if any of you reading this are going to Fanfest. What are you expecting from or hoping for with Valkyrie? I have no expectations of Valkyrie other than it being a fast paced dogfighting space sim. For me it would be a huge mistake for CCP to try and link the game directly in the TQ server in some way. There might be many who’d like that but for me New Eden is big enough for there to be games based in that world, not linked to each other. Technically and from a design standpoint I don’t see a need for that. What attracted you to EVE: Valkyrie? I actually was not that much attracted to Valkyrie to begin with. 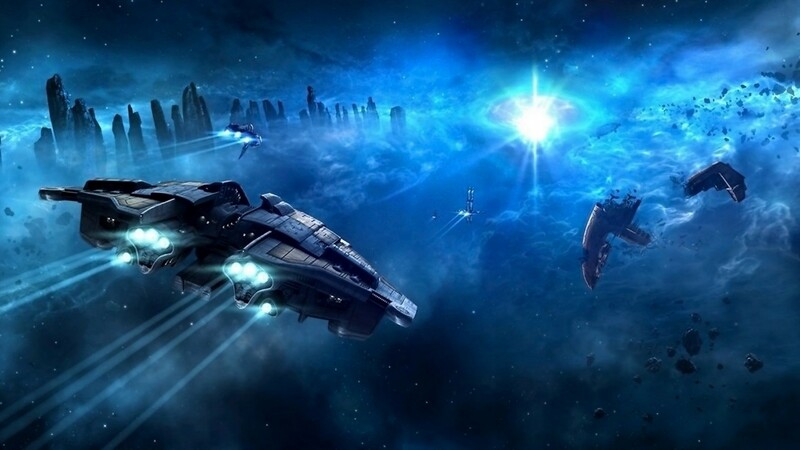 The media that was released during it’s development didn’t really stand out compared to its hype competitors, and me not being an EVE guy made that while I was aware of the game, I wasn’t excited or impatiently waiting for news or alphas. One day in the past year they announced the opening of registration for testers. Being the prospective VR developer, any free experience was good to take so I filled and submitted the form, then promptly forgot about it. Many months later, this February to be precise, once the curse on AMD GPUs was lifted, I got a surprise invitation in my inbox and went on to play the game for the first time. It’s only then that I got hooked, but it was an immediate and long lasting hook. About 200 hours, to put a number on the strength of that hook. What really made Valkyrie stand out once you try it and reevaluate the other games is the polish. Valkyrie is made for VR, it’s not an afterthought bolted on a classic game. And it’s only by playing it that your realize that the technical decisions taken, even the most controversial, are in there for the benefit of the experience and the comfort of the player. As much as there is to criticize on its game design, and believe me I could go on for ages on that topic, on the technical side, Valkyrie is one of the early jewels of VR. Do you play EVE? Short answer, no. Slightly longer answer, I tried. I really did. Multiple times over the years. On paper it should have been a perfect game for me. I am a big fan of sci-fi and space operas. I marathon Legend of Galactic Heroes every year. Twice. I love MMORPGs. I play lots of strategy too. I’m a freaking good liar. It would have been the perfect match, but it wasn’t meant to be. Something didn’t click and unfortunately I cannot put my finger on what exactly it was. It was like Babylon 5 all over again. A perfectly rounded piece that checked all the boxes but didn’t fit into my square. Now, may be Valkyrie will grind the edges, after an there is a lot of grinding in Valkyrie, so who knows. Have you produced content for other games? Long time ago, in forgotten parts of the French speaking internet, I was a rather proficient producer of text content for obscure free to play Asian MMORPGs of the early noughties. I wrote lots of newbies guides, quest walkthroughs and the likes. But then I graduated, started my past career of corporate software engineer and so my internet presence was reduced to be a lurker. Now that that’s behind me too, I intend to produce content for VR games rather exclusively, but I also will produce my own games, for which I will produce content, and keep iterating until I find my formula. What is unique about your stream? The bad burbled accent and the occasional ominous whispers? The horrible music that only I enjoy? No actually there is nothing unique about me, my stream or my content at the moment. As I said before, I’m still searching for my own touch and as a newbie streamer I’m not that arrogant to believe that I already have it. I do have lots of influences mostly from game critics that I consume without restrain. I intend to evolve in the genre of John Bain, Jim Sterling, Yahtzee Croshaw and the likes. Still nothing unique; what was that quote again about good artist copying and great artists stealing? What is your favorite ship? The Storm. No contest. If I wanted to play a game where my performances were defined by my capacity to use my thumbs on the sticks of my pad, I could have picked any console FPS out there. This is a VR game. Head tracking should be key, and it is the sole weapon of the heavy class. Now, in any other heavy, as they all have Area of Effect weapon, the game style can be summarized as spray and pray. Not in the Storm. Its Laser Gatling is a weapon of chirurgical precision coupled with brutally stealth damage. My targets tend to die before they realize I’m locked on them. But it only does hit on one pixel, with a low rate of fire, and It lacks a lead indicator, so you have to adjust your aim for the speed of your target and the network latency when playing on the other side of the pond. The weapon is so precise that your breathing impacts your aim. A pleasure to play. The kind of ship VR is made for. What are you expecting from or hoping for with Valkyrie? I’ll start with a negative: I really hope that the progression system goes down the drain, really soon. Locking different classes on a team based multiplayer game in 2016 is just plain stupid. Even by 2006 standards it would have been madness. Can you imagine TF2 with all new players having only access to the Soldier and the others classes like the Heavy and the Medic needing to be unlocked after dozens of play hours? That’s what has to be changed ASAP if the game is to succeed in any way or form. Then, as others mentioned, the potential for e-sports is huge. Lots of skill plays to impress spectators and commenters. But also lots of features to implement to make the game “stage friendly”. 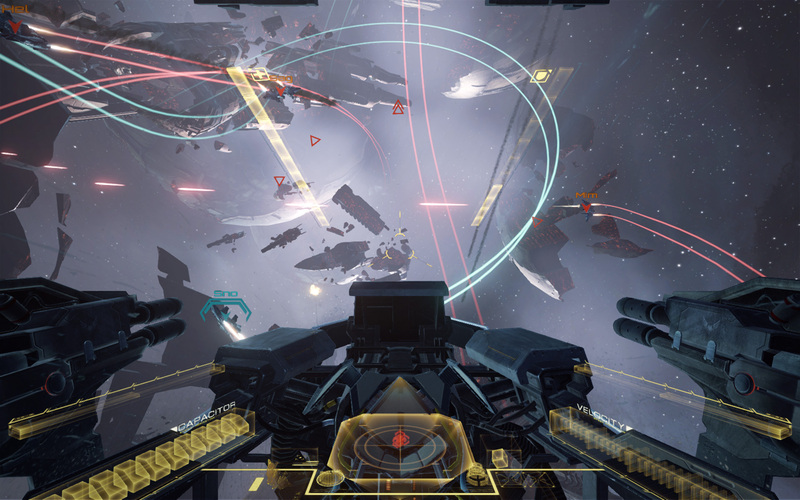 If tournament directors then manage to pull out inspiration from movies dog-fight sequences like in Top Gun and series space battles scenes like those of BattleStar Galactica, the entertainment value of Valkyrie could easily surpass any other popular e-sport.